Barkers were again active during the 1946 season as a new limited company, J Barker & Sons (Great Yarmouth) Ltd. They secured the sole license to take walkies in the town and acquired bigger premises at 22 St Peter’s Plain (known to staff as “the factory”) to where the processing and printing was transferred. Barkers also had a house (later converted to a shop) at 53 Regent Road. For the next few years a by then vintage cine-camera was placed in the front garden and many thousands of Barker’s walkies were taken from here. Due to a shortage of film a single frame image was taken and simply printed three times. The business now employed quite a few people in the season, taking photographs, processing film, drying, and making the prints. 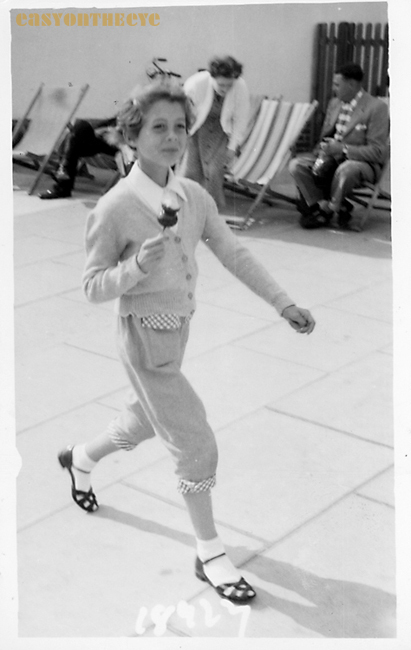 Post war Barkers Walkie : Gail Meadows snapped on the promenade at Gorleston having been for a toffee apple. Probably taken with a Leica 111. Courtesy of Gail Godfrey (she was also snapped on the way to the shop!). They still took some cine camera walkies but after the 1958 season these cameras were retired. 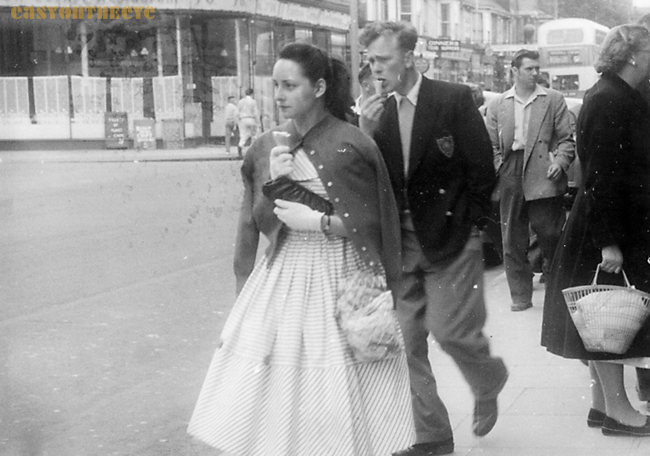 Barkers Post war cine snap : David and Maureen Smith eating ice-cream as they wandered past 53 Regent Road in the Summer of 1958. This is the latest datable cine camera walkie discovered. It is a single frame from three identical images on a sheet. David himself worked for Barkers in the early 1950s (photo courtesy David Smith). 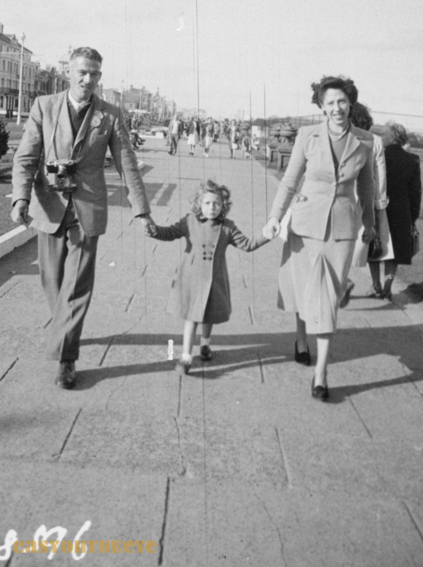 Example Post war 1 : George, Gail and Joyce Meadows snapped by a Barkers operator outside the Wellington Pier Winter Gardens. An off-duty George is wearing his red Barkers blazer, a Great Yarmouth Corporation licence badge on his lapel and his Leica 111 around his neck. Joyce also worked for the company. Courtesy of Gail Godfrey. 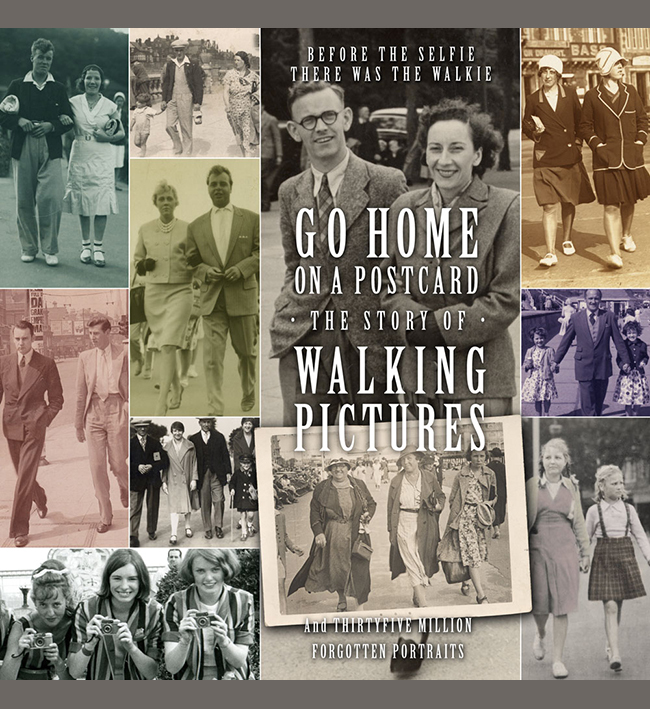 George Meadows in the photograph above had worked as a camera operator for Cine Snaps before WW2 and returned to Great Yarmouth after being demobbed from the RAF. Edgar Barker offered George his job back, and set his wife Joyce on selling the prints from the kiosks. George and Joyce worked for Barkers for over 30 seasons until George retired in 1979. Barkers started taking colour walkies in 1971, but stopped the trade around 1979, the end of an era. Barkers Photographic Ltd is however still trading, and still owned by the family, undertaking studio, holiday camp and event photography, along with a processing service for professional photographers. I am grateful to John Barker, Joan Barker, Janet Barker, Jeffrey Bean, Jane Billington, John Bracey, Albert Cadmore, Reg Cadmore, Barry Drake, James Fisk, Gail Godfrey, Graham Hooper, Malcolm Howard, John Race, Simon Robinson, Ian Robb and David Smith for their help with my researches. Text copyright Paul Godfrey and Easy On The Eye.